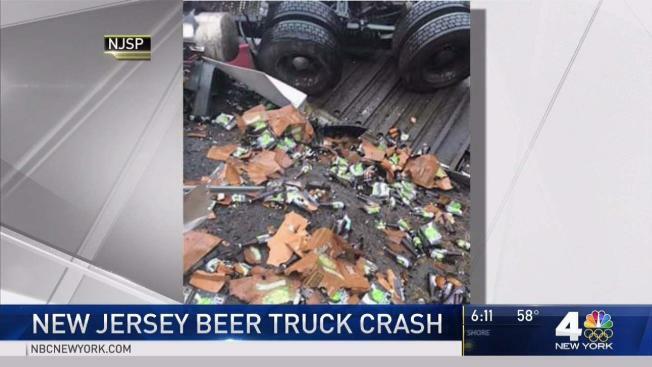 A tractor-trailer carrying cases of beer overturned on a New Jersey highway Friday morning, spilling brew all over the road. The truck was going eastbound on Interstate 280 in Hanover Township in Morris County when it flipped, according to state police. The truck was carrying cargo that consisted of glass beer bottles, and many of them were broken and scattered along the side of the road. No other vehicles were involved in the accident and no serious injuries were reported, police said. As a result of the accident, all lanes were closed and eastbound traffic was diverted off of Exit 1 for hours.